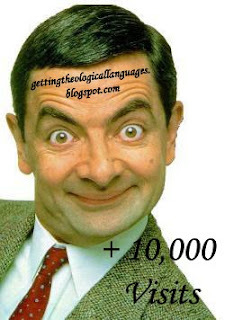 Thanks to everyone who has made use of and encouraged me about the theological language sites I've created. This year at SBL, I was amazed by all the comments I received about those sites and very, very grateful for all of the positive feedback. So, keep spreading the word. Remember, there are six sites: Getting Greek, Getting Hebrew, Getting Aramaic, Getting (Theological) German, Getting (Theological) French and Getting Theological Languages, the last of which is a portal for the other five. Again, hats off to all those who've helped us surpass the 10,000 mark, here's to another 10,000!! !